Want to live somewhere that will energize you all day and night? 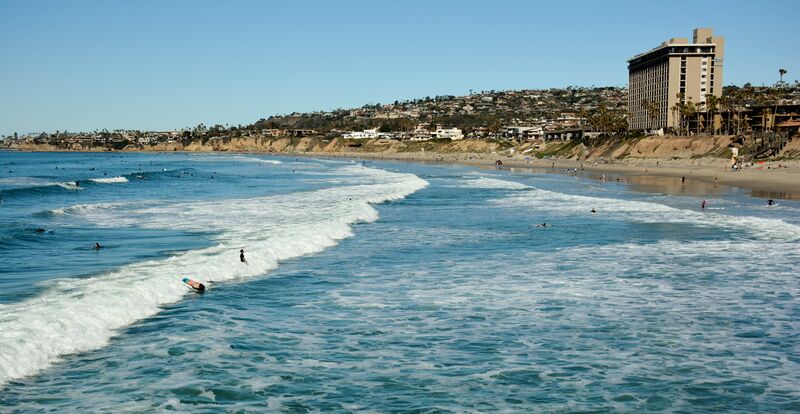 Then buckle up, because San Diego, California’s Pacific Beach is where you will want to be! While this neighborhood is definitely a popular spot for young adults, older individuals and families from different backgrounds will appreciate all the possibilities this area has to offer! During the day, you may find yourself bouncing around the different shops and restaurants situated between Mission Beach and the shores of La Jolla, but there is a lot to do outdoors too. If you like to participate in more athletic activities, you can always start a game of beach volleyball, rollerblade around town, or go surfing! If you’re in the market for a family-friendly outing, you can visit nearby attractions throughout San Diego and get some quality time in one of the beautiful parks, or enjoy all that the beach has to offer. This neighborhood was designed for outdoor enjoyment, so you’ll never run out of reasons to experience the perfect weather here. While fun in the sun is a must, don’t forget to save some energy for the evenings! There are plenty of family-friendly restaurants so everyone can get in on the fun, but individuals looking for exciting bars and dance clubs will be very satisfied with their options here. Once your day ends, chances are you’ll be falling into bed in a small-to-medium sized apartment ranging in layout from studio to four-bedroom. Does this little slice of heaven sound like the kind of life you want to pursue? Then keep reading to learn more about Pacific Beach! It’s good to know that this area is primarily inhabited by active, 20-to-30 year-olds either attending college or raising a family, but examining the cost of living is probably the first place you should start when determining if moving to this area is for you. Looking at the numbers, you’ll find that the cost of living in Pacific Beach is 19% higher than the San Diego average. Most of the difference is made up of the cost of housing, which is 189% higher in Pacific Beach when compared to the national average. So what price range can you expect when looking for accommodations here? As mentioned before, the majority of housing is made up of small studios and medium-sized apartments with two-to-four bedrooms, and 86.1% of real estate in the Pacific Beach neighborhood consists of renters. Rental prices are averaging $2,162 per month, which is actually lower than 43% of California’s neighborhoods. If you think you’re interested in buying real estate in the area, homes are $653,482 on average. While many of these numbers may seem daunting, it’s also important to mention that the income of the neighborhoods in this area is higher than 71.7% of the neighborhoods in America. Outdoor recreation lovers will appreciate the endless options of activities to be had on the beach, in the parks, and around town. Foodies will be filled every day with cuisine from all corners of the world. Fashionistas will have to watch their bank accounts in this shopping paradise. Anyone falling into one or all of these categories need to move to Pacific Beach, STAT! Let’s talk about good eats. The Pacific Beach Fish Shop serves up only the freshest catch in the form of sandwiches, salads, and plates. Be sure to order one of their award-winning tacos! This eatery was established in 2010 and remains a popular destination for locals and tourists. Konito’s Cafe, a sister restaurant of Kono’s Cafe, is a family-friendly breakfast and lunch venue. The menu has classic American fare as well as some dishes with a Southern California twist! Hoboken Pizza & Beer Joint is a hot spot for the best pizza and beer in town. Their menu is also host to a slew of other tasty food including hot and cold sub sandwiches, pastas, and salads. Experience all of the best outdoor activities that Pacific Beach has to offer! At Crystal Pier, you can go fishing or enjoy one of the many other activities that offer beachgoers a livelier alternative to sunbathing and swimming. You can rent a bike at Pacific Beach Bikes and explore the many bike trails that wind around the neighborhood! While you can stop at any of the beautiful parks along the bike paths, you’ll want to make a point to visit Kate Sessions Park for stunning views of Mission Bay, the Pacific Ocean, and the city below. The 79-acre park is separated into two areas: one for picnicking, gentle sports-play, and walking trails, and another side that is ideal for hiking and exploring the rugged beauty of the area. Families and friends will love how close they are to thrilling attractions. Belmont Park is a historic amusement park in nearby Mission Bay that sits right on the waterfront! SeaWorld San Diego is the perfect day trip destination where learning and fun go hand in hand. Birch Aquarium at the Scripps Institute of Oceanography in nearby La Jolla will give you the chance to experience sea life up close and personal. They also have numerous programs for all ages that will keep you engaged in ocean adventures all year long! Ready to shop until you drop? Pangea Outpost on Garnet Avenue has everything you need and more, from jewelry and apparel to local and imported arts and goods! Visit the South Coast Surf Shop for all of your surfing and beach leisure needs. If you’re looking for fresh fruits, vegetables, and finds, the Saturday morning Farmers Market is from 8:00 a.m. to noon and is located at 4150 Mission Blvd between Reed & Pacific Beach Blvd. If you want the chance to walk the beach while also scouting out great finds on souvenirs and trendy boutiques, look no further than The Boardwalk! Whether you are in the mood for casual afternoon drinking beer, or a fun night out with your favorite pack of people, Pacific Beach has you covered. Firehouse is an American eatery and lounge that has themed, artisan cocktails, wine, beer, and champagne ready to be enjoyed in a rugged, yet classy, setting. The Pacific Beach Shore Club gives its guests the perfect beach bar experience with drinks prepared with “classic Mexican flair” and a chance to feel immersed in California’s surf culture. If you are a fan of craft beer, then Draft is the place to be! They have 69 craft brews on top and an awesome deal on draft beer pours if you join their “Craft Club”. Pacific Beach is a beautiful city with a lot to offer its residents. From exquisite dining and shopping options to thrilling activities and attractions, it can’t be beat! If you’ve done your homework about the cost of living in this area and are more confident than ever about moving here, what is stopping you? Start living your best life on the energetic sands of Pacific Beach! It’s natural to have doubts about certain aspects of moving, which is why having a partner to help you get settled in is essential. That’s where A-1 Self Storage comes in! Our self storage professionals are not only prepared to help you find the best self storage unit for your needs and budget but also genuinely care about your experience moving to the area. We always have moving and packing supplies in our office, along with a friendly self storage associate who can answer any questions you may have about packing, moving, or about the area you are moving to in general! We can’t wait to help you start your life in one of San Diego’s trendiest neighborhoods, so stop by A-1 Self Storage in Pacific Beach or give us a call and rent today!